Classic Modern Portfolio Theory (MPT) is a passive portfolio management system where one selects a set of uncorrelated assets, sets allocation percentages for each, and periodically rebalances the portfolio’s assets to bring allocations back in line with original targets. It is believed the market is inherently an unpredictable random walk. Thus MPT advocates buy-and-hold diversification. Tactical Asset Management actively alters a portfolio’s asset composition and/or allocation weights in response to changing market conditions. Because market cycles are tied to economic cycles and different market sectors do better during different phases of the economic cycle, the rationale for sector rotation is easily understood. Sectors provide the power strokes for a portfolio just like pistons in an engine. Although most professionals practicing sector rotation by periodically adjusting allocation weights to over-weight or under-weight market sectors, it turns out that optimum algorithmic trade performance is achieved by utilizing True Sector Rotation, where only the trend leader is owned from among a set of candidates. Not only are returns improved, but risk is reduced simply by avoiding the trend laggards. Furthermore, by combining multiple True Sector Rotation Strategies into a single portfolio, remnant volatility is further reduced. Risk is reduced by (a) diversification within a fund, (b) avoiding trend laggards, and (c) averaging the remnant volatility of multiple home-run hitters. Of course, return remains as the average of multiple home-run hitters. Holistic Risk Management — Safety First! Risk is not a one-dimensional problem cured by a single act of diversification. There are numerous sources of risk related to companies, funds, strategies, markets, political events, natural disasters, and even personal matters. Holistic Risk Management for investment algorithms examines and addresses the relevant sources of risk within an entire system utilizing a layered Portfolio-of-Strategies to measurably improve investment performance. AlphaDroid was designed to reduce risk on many levels, as described in our white paper “Conquering the Seven Faces of Risk“. 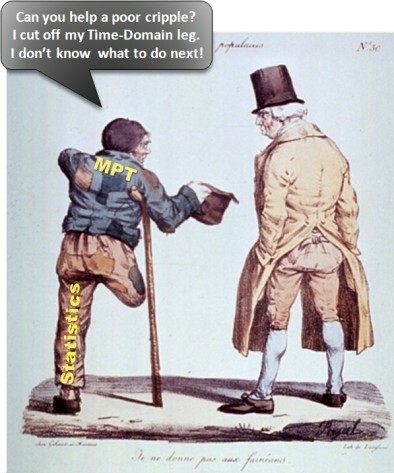 Why is MPT Blind to Market Trends? Broad diversification within and between asset classes (such as stocks, bonds, money market, and commodities). Periodically rebalancing asset allocations back to the portfolio’s original target percentages. Here is a test of your observational skills — read the following Wikipedia definition of MPT and see if you notice what useful information MPT has discarded: “More technically, MPT models an asset’s return as a normally distributed random variable, defines risk as the standard deviation of return, and models a portfolio as a weighted combination of assets so that the return of a portfolio is the weighted combination of the assets’ returns. By combining different assets whose returns are not correlated, MPT seeks to reduce the total variance of the portfolio. MPT also assumes that investors are rational and markets are efficient.” So, what’s missing from this tactical asset allocation? The average world temperature today was 62F. The average temperature in his town for the last decade was 58F. The temperature in his town is most well correlated with that of Hamburg, Germany, and most uncorrelated with that of Sydney, Australia and La Paz, Bolivia. The standard deviation of temperature from average is 3.5F within his state. After pondering all of this great information, the farmer still has no idea whether to plant corn or wait another week. There is no temperature trend information whatsoever from which the farmer might be able to improve his chance of having a great crop this season. By discarding time domain information, MPT is inherently unable to suggest what to buy or sell next month. MPT may be ideal for “buy and hold” investors, but “buy and sell” decisions require time domain data analysis. Today, even the originator of the EMH (Efficient Market Hypothesis), Nobel laureate Eugene Fama, acknowledges returns associated with momentum are pervasive. It’s time to extend MPT’s framework.